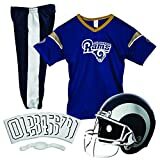 Now your child can support their favorite player or even imagine themselves as part of their favorite team with this authentic Franklin Sports NFL Deluxe team jersey and helmet set. Comes with shirt, pants, helmet and chinstrap along with iron-on numbers (#0-9). Important note: the helmet is for costume use only and should not be used in any actual game or sport capacity. All NFL teams are available, including the New England Patriots, Dallas Cowboys, Philadelphia Eagles, Carolina Panthers, Minnesota Vikings, Green Bay Packers and more. Find yours and let the cheering begin!